Having a baby is a fun and exciting time for new parents, but it also brings about many changes in the home. It is crucial to take precautions to protect infants from hazards early on. This guide will help parents learn how to babyproof each room of their homes to keep their small children safe. Cabinet locks and latches. Secure your kitchen cabinets to prevent your baby from opening the cabinet doors. Leave at least one cabinet open for your baby to explore and fill it with plastic food storage containers. It’s common to store cleaning products, detergents and pesticides under the kitchen sink, but these products are dangerous to babies. Move them up high, out of your child’s reach. Child-resistant lids. If your trash can does not have a lid, get one. This will keep your curious baby from digging through garbage. Medicine bottles should be stored in an upper cabinet and be capped with child-resistant lids. Electrical outlet covers. All electrical outlets should be outfitted with plastic socket covers. This prevents your baby from sticking his or her fingers in the socket and getting electrocuted. Door latches. This prevents your baby from opening the door and wandering into the garage or wherever the door may lead. Knob covers for the stove. Purchase burner covers for your stove top and knob covers for your oven. If you have a digital oven, make sure to lock it when it’s not in use. Slip-resistant tub mat. You will give your new baby a lot of baths. To prevent falls, place a slip-resistant, waterproof mat on the floor of your tub or shower. Toilet lock. Your baby is discovering all he or she can about his or her new living quarters. This means nothing is off limits, not even the toilet. A toilet lock helps keep curious hands out of the bowl. Doorknob and cabinet lock or latch. Purchase locks and latches to keep your baby from getting into any products or items that are stored in these spaces. If you have a bathroom trash can, you will also need to buy a lock or latch for that. Although, it may be best to forgo the garbage can all together until your child is older. Anti-scalding device for the bathtub faucet. Purchase an anti-scalding device for your bathtub faucet. This will keep the water from becoming too hot. If the water is too hot, it could burn your baby’s sensitive skin. Skid-proof bathroom mat. Buy a non-slip bathroom rug or mat to place on top of your tile flooring. This helps keep you and your child safe when getting in and out of the tub or shower. Furniture straps (including nails and screws). One of the most important ways to childproof your furniture is to anchor it to the wall. Purchase furniture straps and secure them to the back of any freestanding TVs, bookshelves, tables and other pieces of furniture that your child could potentially pull down. Soft foam corners and bumper strip tape. Sharp corners such as those found on coffee tables, end tables and bookshelves should be capped off with soft foam corners. For glass tables, line the outside of the table with foam bumper strip tape. This will help prevent your child from getting bumps and bruises. Non-slip rug pads. If you have large area rugs in your home, place a non-slip pad underneath them to keep the corners from pulling up. This can also be a fall hazard. Locks and latches for drawers and cabinets. All media consoles, bar cabinets, filing cabinets and other drawers should be secured with locks and latches. Open shelving should be free of heavy and breakable items. Only place soft, baby-friendly items on the bottom shelves. Keep the ground free of clutter. This can be hard to do with a baby but it will help keep your young child from tripping or getting into something he or she should not. Door latches. All of the doors in your bedrooms and nursery should be equipped with doorknob latches. This will keep your child from opening a bathroom or closet door and getting into mischief. Don’t worry, though. Adults can get around the latches without having to remove them every time. Baby gate. 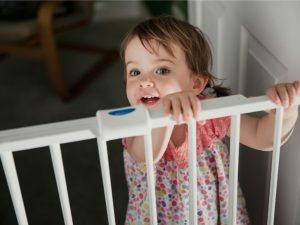 If you don’t like doorknob latches, place a baby gate in the doorway of each bedroom to keep your child out. Blind cord wrap. It’s best to remove all curtains until your child is older. Babies may yank on the curtains in the nursery and bedroom, which will cause the curtains (and possibly the hardware) to fall on your infant. This can cause serious injuries. If you have blinds, purchase a cord wrap to keep your child from becoming entangled. Like with the other rooms and items in your house, make sure bedroom furniture is secured by the methods mentioned previously. The same goes for electrical outlets. Kennel. Your dog, cat or other pet was likely your first baby. Now, your new baby has arrived. The two can definitely live together happily, but sometimes they need their own separate spaces. Purchase a kennel that your pet can stand up and comfortably move around in. You can also designate a certain room in your home for your pet if you do not want to purchase a kennel. Baby/pet gate (multiple). These barriers make it hard for both your child and fur baby to get into places they shouldn’t be. It’s also a safety precaution if you have stairs in your house. Play pen. With this, your baby can still see and interact with the pet, but there’s a layer between them to keep them both safe from unintentional roughhousing. Enclosed litter box. Cat feces carries a lot of bacteria. Purchase an enclosed litter box or place a swinging plastic door on the entrance. Another option is to place the litter box in a room. Leave the door open but put up a baby gate. This allows your cat to jump over the gate but keeps your baby out. Metal feeding bowls. It seems almost impossible to keep your baby out of your pet’s water bowl. For cats, you can elevate the food and water bowls out of baby’s reach. For dogs, buy metal water bowls. Avoid ceramic and glass. Your baby may have fun splashing around, but at least he or she won’t break the bowls.